Last semester, C’est Si Bon was my go-to place. Every Tuesday and Thursday, my friends and I would get out of class and hustle across campus to get there before the lunch rush hit. The food was delicious, varied and affordable. What more could a pack of college students ask for? And now here we are a few months later. C’est Si Bon will be closing this Sunday, Sept. 30. When I first heard the news, I didn’t know how to take it. The crepes at C’est Si Bon have been a staple of my diet at Capital for a long time now. It’s still hard for me to believe that it’s really over. Truly, this is the end of an era. As Capital students, we haven’t had a lot of options for dining in the past. During my freshman year, it was the MDR, One Main, or bust. Rough stuff if you’re living in a dorm room with no kitchen or microwave. It was only two years ago that we were first able to use Capbucks at restaurants on Main Street. Suddenly, we could go to Jimmy John’s, Zoë Café, Moshi Sushi, or C’est Si Bon if we wanted to grab a bite to eat. Trust me, it was a blessing to have a break from Aramark every once in a while. Then just as suddenly, Zoë closed last spring and there was one less place to spread out our taste buds. Just a few months later, we’re back in the same boat with C’est Si Bon and once again it’s time to say goodbye. I’m going to be honest, I wasn’t Zoë’s biggest fan. To me, the food wasn’t all that impressive and the atmosphere seemed like it was trying way too hard to appeal to that hipster-esque millennial crowd. They served drinks in mason jars for crying out loud. Even so, I knew a lot of people who loved Zoë. I know a lot of people who love C’est Si Bon too, myself included. 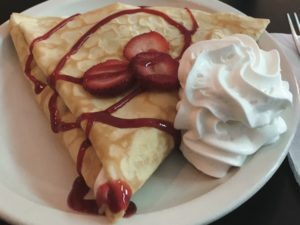 It may seem like we’re just losing crepes here, but we’re also losing a part of our community. Last year, I took my parents to C’est Si Bon for lunch. They were hooked instantly. Whenever they come down to Columbus from my home town, they always ask if C’est Si Bon is open. 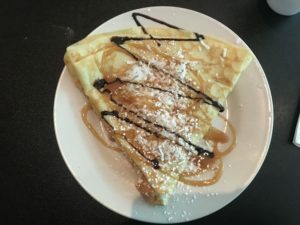 Just Tuesday, I went in for a crepe and ordered something new off the menu. I’d never tried brie before, so I thought I’d give it a shot. When I gave my order, I was actually told that if I was trying the brie I should consider getting a different sauce than usual. They wanted to make sure I didn’t order something that was too rich and creamy to enjoy. C’est Si Bon cares about its customers, and the customers care about C’est Si Bon. So hats off to you C’est Si Bon Café. You did well, and you won’t be forgotten. Finn by Chase: a bank for millennials?